Focused industrialization has positively changed Roha’s socio-economic landscape. And ambitious infrastructure projects have put Mumbai within convenient reach. Living amidst the scenic beauty of the Konkan, with the promise of a tranquil, relaxed lifestyle is another key attraction. From investors to solitude seekers and working professionals, today Roha is the new favourite destination for relocation. Huge infrastructure projects coming up near Roha are enhancing connectivity as well as creating business and employment opportunities. Prominent among these are the Nhava-Sewri Sealink, the Mumbai-Sawantwadi Express Highway and many industrial set-up also present. Roha Roha is close to Mumbai, Karjat and is the next urban hub on the map. It is 120 km south-east of Mumbai, the only one side Mumbai can grow geographically. A prominent station on the Konkan Railway, a new Panvel- Roha local has been proposed to begin by 2015. Roha is connected to Mumbai by the Panvel Harbour railway line and to Karjat by the Panvel-Karjat line. Roha is the starting point of the northern end of the Konkan Railway, whereas Kankanadi near Mangalore is at the southernmost point. The doubling of the railway line between Panvel - Apta - Roha will soon be completed. Also, the electrification of the same will be undertaken in the future. 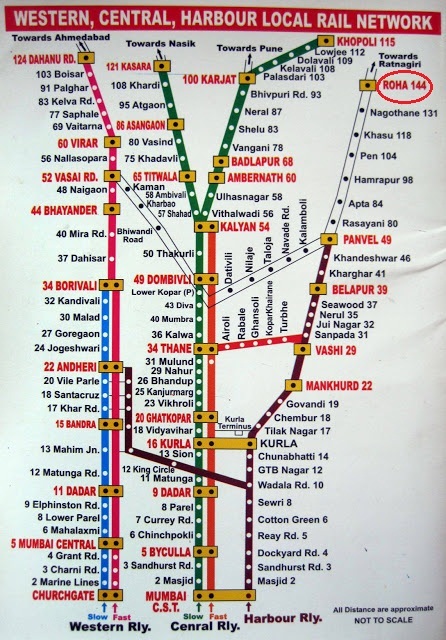 Due to electrification, the suburban local trains would run till Roha, and hence urbanization on a massive scale is expected is take place in this belt. However, the jewel in the crown is the proposed CST-Mahad Local Train Service, slated to commence from 2015. Once operational, this line will put Mumbai within easy reach. Maharashtra Industrial Development Corporation (MIDC) is located at Dhatav. This area is a Chemical Industry zone as declared by MIDC. Roha is surrounded by 69 SEZ areas. New companies are planning for setup & existing companies are in expansion mode, leading to generation of huge employment opportunities. Also proposed is the Delhi Mumbai Industrial Corridor (DMIC – Connect to Dighi Port) and Panvel International Airport, tywo colossoal developments that will drive growth in and around Roha. Dhavir Temple: - Roha is very well known for its Dhavir Temple. Dhavir Maharaj is the prime deity of Roha. Every year the town celebrates Navaratri by holding a festival at the Dhavir Temple which ends on the tenth day - Dasra. On the following day of Dasra, a palkhi (sedan chair) carrying the statute of Dhavir Maharaj is taken through the town where it visits each house for the aarti. It is presumably, only after Durga, Kokatta, that the palkhi is given government salaami (salutation) with full honors. White water rafting on the Kundalika :- The Kundalika is a small river flowing from the Sahyadris to the Arabian Sea. This river originates at a small town called Bhira, 150 km south east of Mumbai. Roha is located on the banks of the Kundalika. The river is a popular destination for enthusiasts of white water rafting. Hanuman Tekadi: - A beautiful temple of Lord Hanuman is built on a hill (Tekadi) from where on can enjoy a sweeping, captivating view of Roha city. The road leading up to the hill top is a popular place with the residents for morning and evening walks. Roha has tropical wet and dry climate, which is characterized by heavy rains in June & July. During most of the seasons it is sunny and pleasant. Monsoon makes the atmosphere more scenic and enjoyable. Today the rates in Virar and Vasai (Mumbai) are 4 times higher than rates in Roha, so it is better to invest money in Roha. Local railway was the only reason for the huge development of the North-Mumbai and, now as there is no vacant land available in Virar and Vasai so the only option is South Mumbai to get develop. Also the rates in Virar and Vasai are stagnant. Now Local Railway is connecting to Roha, so there is big opportunity to be growing south side of Mumbai. You can come here for enjoying your holiday or weekend. This is a good opportunity to get your home in Konkan where there are number of tourist points like Murud, Janjira, Alibaug, Pali Temple, Shrivardhan, Kashid and Phansad wildlife sanctuary. You relax on the beach, pump up your adrenaline with river rafting or simply appreciate the quite natural beauty of the Konkan. © 2014 Roha Megacity SITE OFFICE : Roha Mega City, Pingalsai, Near Roha Railway Station, Tal. Roha, Dist, Raigad.